Makar is what happens when you cross the current indie revolution with a tinge of folk rock. Their debut album, 99 Cent Dreams, is an absolute joy to listen to. Every song is based on a real emotion or real thing, something that a lot of bands just can’t seem to write good songs about these days. This album is catchy and has a sound that definitely stands out from the rest of the bands out there. It’s not going to appeal to the metal heads or rap fanatics, but everyone else out there with an open mind will find an intriguing collection of songs. Andrea and Mark are the two singers of Makar, and both have an extremely impressive vocal range. Mark’s singing is typically more laid back and very smooth to listen to. It flows well with the instrumental work, and his vocals are what give the music a bit of an indie rock vibe. Andrea’s singing is all over the place, but this is not a bad thing at all (it just might make things a little inaccessible to some listeners). Her voice is incredible and it especially shows on songs such as “All I Know”, where she gives an extremely melodic performance that is definitely tear worthy. However, it is her screeches on songs such as the opener “I Hate My Job” that will grab a lot of listener’s attentions. They are very high pitched and sometimes can be compared to some of the female punk singers out there (which is an unusual mix). The instrumental work is superb, there’s no better way to put it. The opener is a fast paced surf-rock esque track that quickly transitions into a more laid back ballad style track. 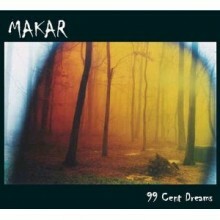 Although Makar has plenty of folk rock vibes, there are also songs that allude to a country style. The group likes to jump between more mellow and up-tempo segments, although I will admit that I personally like the more mellow aspects. It may seem like a crazy mix at times (especially when mixing in the opening track with some of the later ones), but everything falls into place. Makar’s debut album is a wonderful trip through a wonderland of infectious tracks that the average person will be able to relate though. The two vocalist aspect (one male, one female) also gives the music a bit more depth than one would initially think. In an industry that is slowly leaning towards corporate cookie cutter rock ‘n roll and stereotypical rap music, Makar isn’t afraid to think outside of the box and come up with music that anyone can enjoy. 99 Cent Dreams is definitely a noteworthy album, and I can’t wait to see where the group goes from here.